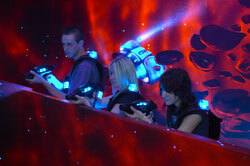 Lasertag League takes playing Megazone to a whole new level, while still maintaining a social, relaxed environment. As an alternative to traditional sports, Lasertag League is still a great way to have fun and get fit. It turns a simple game of laser tag into a competitive sport, where teams battle in the arena using skill, timing and strategy. With a team of dedicated Trainers and a unique handicapping system, Megazone integrates new players and offers onsite training to players new and old, helping them to improve. Each week players are ranked based on their results for each respective game format. At the end of the season, the top ranked players are awarded medallions. With help from sites all around Australia and New Zealand, we've developed a system that is still challenging for veteran players, while still giving a competitive edge for new players.